On June 23, 2016, the United Kingdom voted to end 43 years of European Union membership. This prompted UK Prime Minister David Cameron to resign, effective in October, from his political post and removed London from the EU, which was its largest city. Immediately, Britain’s exit created global shockwaves! Some of the initial headlines are below. The bottom two headlines about the fall of Europe and what this means for America are among the subjects of this article. How Brexit argues against the Islamic Antichrist is also explained. Without realizing it, Donald Trump has alerted Americans to their potential prophetic union with the Brits in Ezekiel 38:13. 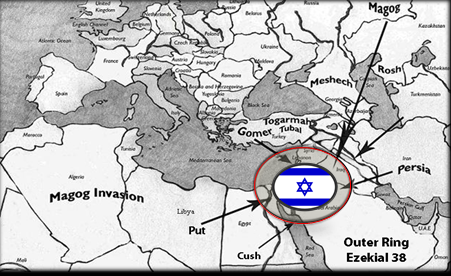 The verse identifies four populations that seem to be protesting the Middle East invasion described in Ezekiel 38 and 39. This prophecy finds fulfillment in the last days and some of today’s top Bible teachers believe that the foretelling is soon to happen. In this scenario, “the merchants of Tarshish” appear to represent the British Isles and not the EU (Roman Empire) at large. Therefore, the UK departure from the EU aligns perfectly with Ezekiel 38:13. From the prophetic perspective, I thoroughly expected this Brexit result. German Chancellor Angela Merkel promptly warned EU member states against drawing hasty conclusions about Britain’s decision to quit the bloc, as that risked further splitting Europe. Bible prophecy buffs should follow this same sound advice. The initial knee jerk tendency from the prophetic perspective is to turn away from the teaching that the EU represents the “Revived Roman Empire,” which is predicted in Daniel chapters 2 and 7. The concern is that, with the departure of the UK and whatever other nations may follow, the EU will not emerge into this revived robust empire. According to traditional teaching, the Antichrist arises out of the revived Roman Empire. The Romans destroyed Jerusalem and the second Jewish temple around 70 A.D. As such, the most widely accepted interpretation is that the Roman Empire will revive as per Daniel 2 and 7 and the Antichrist will emerge at that time and be of European descent as per Daniel 9. Brexit actually reinforces the concept of a Revived Roman Empire, when you understand Ezekiel 38:13 in correlation with the timing of the emergence of this crazed charismatic world leader. The ANTICHRIST ARISES AFTER EZEKIEL 38 and several other globally impacting biblical foretellings. The sequence of significant prophetic events is most likely as follows. These events are explained in The Now Prophecies book. 12. Ezekiel 38:13, the decline of the UK and USA. (The Now Prophecies book explores the possibility that America represents the “young lions” in this verse). 13. Daniel chapters 2, 7 and 9 concerning the Revived Roman Empire and revealing of the Antichrist. This list above does not include every end time’s prophecy, but it does identify about a dozen epic events that should precede the revival of the Roman Empire and the arising of the Antichrist. The original intentions of Europe to form into a successful union modeled after the United States of America was a noble endeavor, but an extremely difficult proposition to put in place. As good as the idea sounded, the experiment hasn’t worked out well as evidenced by Brexit. The European nations have different languages, economies, histories of conflicts and many more diversities. Attempting to bridge these divides is like cramming a square peg into a round whole, or mixing oil with water. Conversely, the USA was birthed in unity, it was not an afterthought filled with cultural complexities and seemingly unsurmountable hurdles. We were built up as one nation under God, with liberty, justice and freedom for all. The point is that the Revived Roman Empire results OUT of NECESSITY, not out of noble intentions! Ask yourself the question, what will the condition of the world have to be in order for a one world leader to emerge, for all the nations of the world to surrender their sovereignty, their currencies and their armies? As the list of episodes above finds fulfillment, the world will be in a state of chaos. The nations will be clamoring for some semblance of stability. Europe will likely be one of the places less adversely affected by these prophecies. As such, it will be perfectly positioned to create some form of a global government, which a chaotic world will invite and embrace. Daniel 7:23-25 and Revelation 17:12-16 predict the emergence of a world order that ultimately divides into a ten division state, which is governed by ten kings having allegiance with the Antichrist. Over the past decade a new theory has emerged that the Antichrist will be a Muslim, probably from Assyria or Turkey, rather than a European from the Revived Roman Empire. Britain’s exit from the EU should initially excite the advocates of this theory. They can suggest that an Antichrist of European descent now seems less likely. There exists a plethora of problems with the Islamic Antichrist theory and a good read on the subject is a book authored by Dr. David Reagan called, The Man of Lawlessness: The Antichrist in the Tribulation. Dr. Reagan, along with myself and many others interviewed inside of his book, reject the Islamic Antichrist theory. In my estimation, Brexit also argues against the Muslim Antichrist theory when you align the coming Middle East war prophecies chronologically. As identified previously, Psalm 83 is followed by Ezekiel 38, which is followed by the Revived Roman Empire and the emergence of the Antichrist. 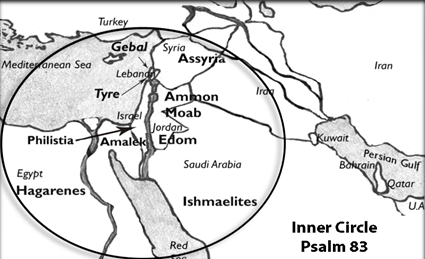 Psalm 83 is the concluding Arab-Israeli war. This future final conflict involves an “inner circle” of the predominately Muslim nations that mostly share common borders with Israel. The Psalm 83:6-8 confederates consist of ten members, none of which are listed in Ezekiel 38. Ezekiel 38 consists of an “outer ring” of nine populations, which apart from Russia, are also predominately Muslim. After these two wars conclude and these nineteen mostly Muslim armies are soundly defeated, Islam will be almost decimated. By the time the Antichrist arrives, Islam should be a severely compromised and generally unappealing religion. I teach that Psalm 83 is a punch to the gut of Islam, Ezekiel 38 is an uppercut to its jaw and by the time the Antichrist arises, Islam is essentially knocked down to the canvas for the ten count, never to recover again! 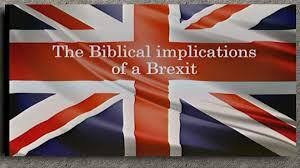 If Britain’s exit from the EU paves the way for the UK to be the “merchants of Tarshish” in Ezekiel 38:13, and after Islam is adversely affected in Psalm 83 and Ezekiel 38, then it is safe to suggest that Brexit argues against the possibility that the Antichrist will be a Muslim. To receive updates on current events through Prophecy Depot Ministries subscribe to our free email newsletter. CLICK HERE to subscribe. 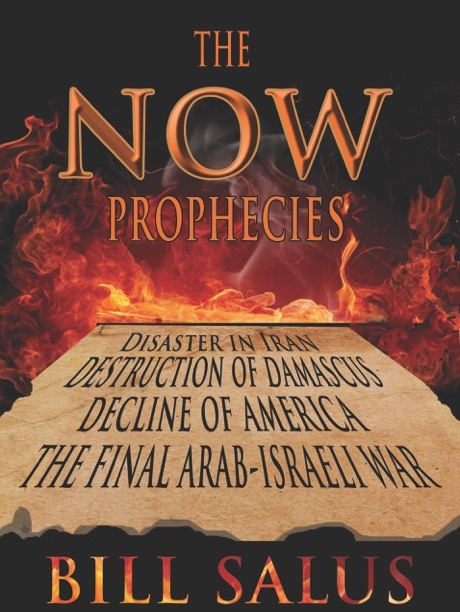 CLICK HERE TO BUY THE NOW PROPHECIES BOOK. CLICK HERE TO BUY THE NOW PROPHECIES DVD. CLICK HERE TO BUY THE NOW PROPHECIES BOOK AND DVD IN A DISCOUNTED BUNDLE PACKAGE. WATCH THE NOW PROPHECIES DVD TRAILER BELOW. [i] All Bible verses for this article are from the New King James Version.